All of the criteria in Rules .1940 through .1946 of this Section shall be determined to be SUITABLE, PROVISIONALLY SUITABLE, or UNSUITABLE, as indicated. If all criteria are classified the same, that classification will prevail. Where there is a variation in classification of the several criteria, the most limiting uncorrectable characteristics shall be used to determine the overall site classification. specifically described in Rules .1955, .1956, .1957, or .1958 of this Section, including any system for which reductions are proposed in the minimum horizontal or vertical separation requirements or increases are proposed to the maximum long-term acceptance rates of this Section. This Rule shall provide for the approval and permitting of E & I systems. (j) notification of any proprietary information, system, component, or device. (b) whether the system meets the standards of an innovative system under Paragraph (3) of this Rule, or whether the system meets the standards of an experimental system under Paragraph (4) of this Rule, as applicable. studies or statistically-valid monitoring of full-scale operational systems. Rules .1955, .1956, .1957 or .1958.
notice shall include any conditions for use, monitoring, and operation. the State upon a finding that the provisions of this Rule including any conditions are met. Use of an innovative system and any conditions shall be described on the Improvement Permit and the Certificate of Completion or Operation Permit. (4) EXPERIMENTAL SYSTEMS: A system may be approved for use as an experimental system as part of a research or testing program which has been approved by the State. The research or testing program shall be conducted by a third party research or testing organization which has knowledge and experience relevant to the proposed research or testing and has no conflict of interest and does not stand to gain financially from the sale of the proposed system. satisfy the standards for approval as an innovative system under Paragraph (3) of this Rule. research or testing program has been approved for an experimental system. Such notice shall include, but not be limited to, conditions for siting, operation, monitoring and maintenance, and number of systems which can installed. Section, with the proposed use of an experimental system specified. conditions specified for use of the system have been met. chassis and designed to be used as a residence, place of business, or place of public assembly without a permanent foundation, in which case sufficient available space shall be reserved for the installation of a replacement system at least equal to the initial experimental system. (iv) When an experimental system is proposed which shall not serve a residence, place of business, or place of public assembly, a repair area or backup system shall not be required. (v) The application for an experimental system shall include statements that the property owner is aware of its experimental nature, that the local health department and State do not guarantee or warrant that these systems will function in a satisfactory manner for any period of time, and that use of the system may need to be discontinued if the system malfunctions and is found to be non- repairable, or if the proposed research or testing program is prematurely terminated. Such statements shall be signed by the owner. (vi) The owner of the site on which an experimental system is proposed shall execute a easement granting rights of access to the system at reasonable hours for monitoring and evaluation to the research or testing organization. This easement shall specify that it is granted for the purposes of researching and testing an experimental wastewater system and shall remain valid as long as the system is to be part of the proposed research or testing program. The easement shall be recorded with the county register of deeds. (vii) Provisions shall be made for operation and maintenance of the system. in the Improvement Permit. Use of an experimental system and any conditions shall be described on the Improvement Permit and any subsequent operation permits, with provisions for a repair area and backup system specified. A condition of the Improvement Permit shall be that the installation be under the direct field supervision of the research or testing organization. (ix) The proposed Improvement Permit and any subsequent operation permits for experimental systems shall be reviewed by the State and found to be consistent with the approved research or testing program prior to issuance by the local health department. (d) Upon completion of the installation and prior to use, an Experimental System Operation Permit (ESOP) shall be issued by the local health department. The ESOP shall be valid for a specified period of time not to exceed five years. Special maintenance, monitoring and testing requirements shall be specified as permit conditions, in accordance with the approved research or testing program. Failure to carry out these conditions shall be grounds for permit suspension or revocation. (e) Prior to expiration of the ESOP and based upon satisfactory system performance as determined during the research or testing program, the local health department shall issue an Operation Permit. Premature termination of the research or testing program shall be grounds for ESOP suspension or revocation. (f) Upon completion of monitoring, research and testing, the research or testing organization shall prepare a final report including recommendations on future use of the system. If the State determines that the results indicate that the standards of Paragraph (3) of this Rule are met, the State shall approve the use as an innovative system. (5) Any proposed changes or modifications in the E & I system shall be submitted for review and approval by the State. (a) The information submitted in the application is falsified. History Note: Authority G. S. 130A-335(e),(f); 130A-343; Eff. April 1, 1993. A person who violates any rule of this Section is subject to the penalty provisions contained in G.S. 130A-22(c) (Administrative Penalties), 130A-23 (Suspension and Revocation of Permits), and 130A-25 (Criminal Penalties). Amended Eff. January 1, 1985. A person who violates any rule of this Section is subject to the injunctive relief provisions of G.S. 130A-18. If any provision of these Rules or the application thereof to any person or circumstance is held invalid, the remainder of the rules or the application of such provisions to other persons or circumstances shall not be affected thereby. History Note: Authority G.S. 130A-335(e); Eff. July 1, 1982. Appeals concerning the interpretation and enforcement of the rules in this Section shall be made in accordance with G.S. 150B and 10 NCAC 1B. Amended Eff. February 1, 1987. (a) The provisions of this Section shall be interpreted, as applicable, in accordance with the recognized principles and practices of soil science, geology, engineering, and public health. (b) The State will provide technical assistance. Local health departments may obtain technical information and assistance from appropriate personnel as may be needed for interpretation of this Section. The provisions of this Section shall not apply to properly functioning sewage collection, treatment, and disposal systems in use or for which a valid permit to install a system has been issued prior to July 1, 1977. This provision is applicable only where the sewage flow and sewage characteristics are unchanged. This provision does not affect the requirements for system operation, maintenance, and management in accordance with Rule .1961 of this Section. Amended Eff. August 1, 1991; December 1, 1990. (C) a free liquid surface within three inches of finished grade over the nitrification trench for two or more observations made not less than 24 hours apart. Observations shall be made greater than 24 hours after a rainfall event. The system shall be considered to be malfunctioning when it fails to meet one or more of these requirements, either continuously or intermittently, or if it is necessary to remove the contents of the tank(s) at a frequency greater than once per month in order to satisfy the conditions of Parts (A), (B), or (C) of this Paragraph. Legal remedies may be pursued after an authorized agent has observed and documented one or more of the malfunctioning conditions and has issued a notice of violation. (2)Ground absorption sewage treatment and disposal systems shall be checked, and the contents of the septic tank removed, periodically from all compartments, to ensure proper operation of the system. The contents shall be pumped whenever the solids level is found to be more than 1/3 of the liquid depth in any compartment. (b) System management in accordance with Tables V(a) and V(b) of this Rule shall be required for all systems installed or repaired after July 1, 1992. After July 1, 1992, system management in accordance with Tables V(a) and V(b) shall be required for all existing Type V and Type VI systems. 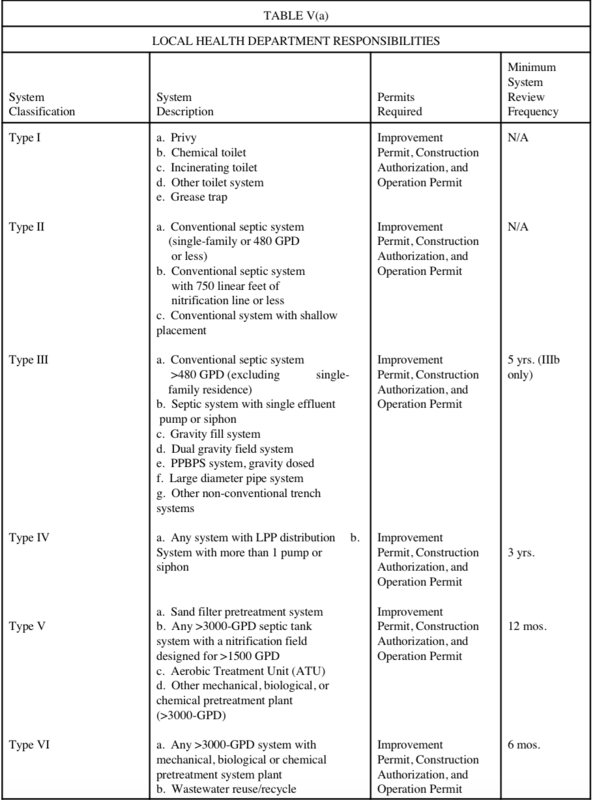 (c) No Improvement Permit or Construction Authorization shall be issued for Type IV, Type V, or Type VI systems, unless a management entity of the type specified in Table V(b) is specifically authorized, funded, and operational to carry out this management program in the service area where the proposed system is to be located. (d) A local health department may be the public management entity only for systems classified Type IV, V(a) and V(b) and only when specifically authorized by resolution of the local board of health. (e) A contract shall be executed between the system owner and a management entity prior to the issuance of an Operation Permit for a system required to be maintained by a public or private management entity, unless the system owner and certified operator are the same. The contract shall include the specific requirements for maintenance and operation, responsibilities of the owner and system operator, provisions that the contract shall be in effect for as long as the system is in use, and other requirements for the continued proper performance of the system. It shall also be a condition of the Operation Permit that subsequent owners of the system execute such a contract. (f) Inspections of the system shall be performed by a management entity at the frequency specified in Table V(b). The management entity shall report the results of their inspections to the local health department at the specified reporting frequency. However, where inspections indicate the need for system repairs, the management entity shall notify the local health department within 48 hours in order to obtain a Construction Authorization for the repairs. (g) The management entity shall be responsible for assuring routine maintenance procedures and monitoring requirements in accordance with the conditions of the Operation Permit and the contract. (h) Sewage systems with multiple components shall be classified by their highest or most complex system type in accordance with Table V to determine local health department and management entity responsibilities. (i) Sewage systems not identified in this Rule shall be classified by the Division of Environmental Health after consultation with the appropriate commission governing operators of pollution control facilities. (j) The local health department shall routinely review the performance and operation reports submitted in accordance with Table V(b) of this Rule and shall perform an on-site inspection of the systems as required in Table V(a). (k) The certified operator shall hold a valid and current certificate from the appropriate commission, and nothing in this Section shall preclude any requirements for system operators, in accordance with Article 3 of G.S. 90A. (l) A sewage collection, treatment, and disposal system that creates or has created a public health hazard or nuisance by surfacing of effluent or discharge directly into groundwater or surface waters, or that is partially or totally destroyed shall be repaired within 30 days of notification by the state or local health department unless the notification otherwise specifies a repair period in writing. If a system described in the preceding sentence has for any reason been disconnected, the system shall be repaired prior to reuse. The state or local health department shall use its best professional judgement in requiring repairs that will reasonably enable the system to function properly. If, for any reason, a sewage collection, treatment, and disposal system is found to be nonrepairable, or is no longer required, the system shall not be used, and may be required to have any contents removed, collapse any components and backfill, or otherwise secured as directed by the authorized agent to protect the public health and safety. (m) When necessary to protect the public health, the state or local health department may require the owner or controller of a malfunctioning system to pump and haul sewage to an approved wastewater system during the time needed to repair the system. (1) The privy building shall afford a reasonable degree of protection from bad weather conditions. a new pit and the old pit completely covered with earth. (3) If the pit caves in, a new pit shall be provided. (2) Fowl and other animals shall not be harbored in the privy building. (3) Seat cover shall be hinged and closed at all times when the privy is not in use. (4) Flies shall be excluded from the pit at all times. (5) Ashes, garbage, and trash shall be kept out of the pit. An "approved privy" shall consist of a pit, floor slab, and seat assembly housed in a building which affords privacy and reasonable protection from the weather. (1) The pit shall consist of an excavation at least 42 inches square and in no case shall the bottom of an excavation be closer than one foot from the seasonally high water table or rock. (2) The pit shall be properly curbed to prevent caving. In sandy or loose soil, the curb should extend the full depth of the pit. In tight soils, partial curbing is acceptable if it prevents caving. (3) The privy floor slab shall be constructed of reinforced concrete. Where it is impractical to secure or construct reinforced concrete floor assemblies, wood construction shall be acceptable provided the floor slab is made of rough sub-flooring and covered with tight tongue-and-groove flooring or other type flooring materials to provide strength and prevent entrance of flies and mosquitoes to the privy pit. Where wood construction is used, floors shall be anchored to at least four-inch by four-inch sills. (4) Wood used for riser, seat assemblies, and the floor slab shall be tongue-and-groove or plywood (exterior or marine) material. (5) Privies shall not be used for the disposal of water-carried sewage. Amended Eff. December 1, 1990. (a) Where an approved privy, an approved septic tank system, or a connection to an approved public or community sewage system is impossible or impractical, this Section shall not prohibit the state or local health department from permitting approved non-ground absorption treatment systems utilizing heat or other approved means for reducing the toilet contents to an inert or stabilized residue or to an otherwise harmless condition, rendering such contents noninfectious or noncontaminating. Alternative systems shall be designed to comply with the purposes and intent of this Section. connection to a system approved under this Section or to a system approved under the rules of the Environmental Management Commission. Pumping and hauling wastewater effluent shall be performed by a septage management firm permitted in accordance with G.S. 130A-291.1. (c) Incinerating, composting, vault privies, and mechanical toilets shall be approved by the state agency or local health department only when all of the wastewater is handled by a system approved under this Section. (d) Sewage recycling systems which discharge treated waste-water meeting the state drinking water standards may be used only for toilet flushing and recycled sewage shall not be used for body contact or human consumption. Such systems must be approved by the state or local health department. (e) Chemical or portable toilets for human waste may be approved in accordance with G.S. 130A-335. Chemical or portable toilets shall have a watertight waste receptacle constructed of nonabsorbent, acid resistant, noncorrosive material. Amended Eff. August 1, 1991; January 1, 1990; Temporary Amendment Eff. January 20, 1997; Amended Eff. August 1, 1998. (a) LOW-PRESSURE PIPE SYSTEMS: Low-pressure pipe (LPP) systems with a two to five-foot pressure head may be utilized on sites which are SUITABLE or PROVISIONALLY SUITABLE for conventional or modified systems and on sites where soil and site conditions prohibit the installation of a conventional or modified septic tank system if the requirements of this Paragraph are met. naturally occurring soil at shallow depths (generally 12 to 18 inches) in narrow trenches not less than eight inches in width and spaced not less than five feet on center. Trenches shall include at least five inches of washed stone or washed gravel below the pipe and two inches above the pipe; and four inches of soil cover. (C) a watertight supply manifold pipe, of Schedule 40 PVC or equivalent, for conveying effluent from the dosing chamber to the low-pressure network. procedures to assure proper distribution of effluent over the nitrification field are approved. Landscaping of the LPP distribution field shall be constructed to shed rainwater or runoff. All other requirements of Rule .1940 of this Section shall be met. (B) Site suitability for an LPP system shall be based on the first 24 inches of soil beneath the naturally occurring soil surface. This 24 inches shall consist of SUITABLE or PROVISIONALLY SUITABLE soil as determined in accordance with Rules .1941 through .1944 and .1956 of this Section. (C) Location of the septic tank, other approved pretreatment unit, pumping or dosing chamber, and nitrification field shall be in accordance with Rule .1950 of this Section. Horizontal distances from the nitrification field shall be measured from a margin two and one-half feet beyond the lateral and manifold pipes. (D) There shall be no soil disturbance of the site or repair area for an LPP system except the minimum required for installation. (E) The available space requirements of Rule .1945 of this Section shall apply. (3) Table IV shall be used in determining the long-term acceptance rate for LPP systems. The long-term acceptance rate shall be based on the most hydraulically limiting, naturally occurring soil horizon within two feet of the ground surface or to a depth of one foot below the trench bottom, whichever is deeper. The long-term acceptance rate shall not exceed the mean rate for the applicable soil group for food service facilities, meat markets, and other places of business where accumulation of grease can cause premature failure of a soil absorption system. Long-term acceptance rates up to the maximum for the applicable soil group may be permitted for facilities where data from comparable facilities indicates that the grease and oil content of the effluent will be less than 30 mg/l and the chemical oxygen demand (COD) will be less than 500 mg/l. (4) In calculating the number of square feet for the nitrification field, the design sewage flow shall be divided by the long-term acceptance rate from Table IV. In calculating the minimum length of trenches in the LPP system, the total square footage of the nitrification field shall be divided by five feet. (5) Low-pressure systems shall be designed for uniform distribution of effluent. The trenches shall be level and parallel to the ground elevation contours. the first and last hole along the lateral. less than 1/8-inch) may be used in no more than one-third of the lateral lines where necessary to balance flow distribution on sloping sites. However, for systems serving restaurants, foodstands, meat markets and other establishments where effluent is expected to have a high clogging potential, the minimum hole size shall be 5/32-inch. (C) Maximum hole spacing shall be as follows: Soil Group I, five feet; Soil Group II, six feet; Soil Group III, eight feet; and Soil Group IV, ten feet. difference between the highest and lowest laterals exceeds three feet. between laterals branching off a common supply manifold and to compensate for the bottom lines receiving more effluent at the beginning and end of a dosing cycle. The lateral network shall be designed to achieve a ten to 30 percent higher steady state (pipe full) flow rate into the upper lines, relative to the lower lines, depending on the amount of elevation difference. Septic tanks, pump tanks, pump dosing systems, siphons, and siphon dosing tanks shall be provided in accordance with Rule .1952 of this Section. end of all lateral lines. simultaneous adjustment of multiple valves. Turn-ups shall be provided at the ends of each lateral, constructed of Schedule 40 PVC pipe or equivalent, and protected with sleeves of larger diameter pipe (six inches or greater). Turn-ups and sleeves shall be cut off and capped at or above the ground surface, designed to be protected from damage, and easily accessible. The supply manifold shall be sized large enough relative to the size and number of laterals served so that friction losses and differential entry losses along the manifold do not result in more than a 15 percent variation in discharge rate between the first and last laterals. (i) The ratio of the supply manifold inside cross sectional area to the sum of the inside cross sectional areas of the laterals served shall exceed 0.7:1. (ii) The reduction between the manifold and connecting laterals shall be made directly off the manifold using reducing tees. (iii) Cleanouts to the ground surface shall be installed at the ends of the supply manifold. Gate valves shall be provided for pressure adjustment at the fields whenever the supply line exceeds 100 feet in length. Valves shall be readily accessible from the ground surface and adequately protected in valve boxes. liquid capacity of the portions of manifold and supply lines which drain between doses. trench(es) is installed in fill material. A fill system, including an existing fill site, may be approved where soil and site conditions prohibit the installation of a conventional or modified septic tank system if the requirements of this Paragraph are met. (A) Nitrification trenches shall be installed with at least 24 inches separating the trench bottom and any soil horizon unsuitable as to soil structure, clay mineralogy, organic soil, rock or saprolite. However, if a low pressure pipe system is used, the minimum separation distance shall be 18 inches. (B) Nitrification trenches shall be installed with at least 18 inches separating the trench bottom and any soil wetness condition. This separation requirement for soil wetness conditions may be met with the use of a groundwater lowering system only in Soil Groups I and II, with suitable structure and clay mineralogy. However, if a low pressure pipe system is used, the minimum separation distance shall be 12 inches. (C) Systems shall be installed only on sites with uniform slopes less than 15 percent. Storm water diversions and subsurface interceptor drains or swales may be required upslope of the system. (D) The long-term acceptance rate shall be based on the most hydraulically limiting soil horizon within 18 inches of the naturally occurring soil surface or to a depth one foot below the trench bottom, whichever is deeper. The lowest long-term acceptance rate for the applicable soil group shall be used for systems installed pursuant to this Rule. However, the long-term acceptance rate shall not exceed 1.0 gallons per day per square foot for gravity distribution or 0.5 gallons per day per square foot for low-pressure pipe systems installed on sites with at least 18 inches of Group I soils below the naturally occurring soil surface or to a depth of one foot below the trench bottom, whichever is deeper. (E) If the fill system uses low-pressure pipe distribution, all the requirements of Paragraph (a) of this Rule, except Paragraph (a)(2)(B), shall apply. Systems with a design daily flow greater than 480 gallons per day shall use low-pressure pipe distribution. not have discreet layers containing greater than 35 percent of shell fragments. additional fill material is incorporated. elevation contours of the slope. rise to run ratio of 1:3.
department) indicating that the fill material was placed on the site prior to July 1, 1977.
sand or loamy sand (Group I) for a depth of at least 24 inches below the existing ground surface. This fill material shall have no more than ten percent by volume of fibrous organics, building rubble, or other debris. This fill shall not have discreet layers containing greater than 35 percent of shell fragments. However, if at least 24 inches of Group I fill material was in place prior to July 1, 1977, additional fill with soil texture classified as Group I may be added to meet the separation requirements of Paragraph (b)(2)(D) of this Rule. (C) Soil wetness conditions, as determined by Rule .1942(a) in this Section, are 18 inches or greater below the ground surface of the fill placed on the lot prior to July 1, 1977. This requirement shall be met without the use of a groundwater lowering system. (III) A condition is placed upon the Improvement Permit to require connection to a public or community sewage system within 90 days after such system is available for connection and after it is determined that 300 feet or less of sewer line is required for connection. it is determined that 300 feet or less of sewer line is required for connection. (M) The available space requirements of Rule .1945 of this Section shall apply. (F) The design flow shall not exceed 480 gallons per day. accordance with this Rule to serve a design unit with a design flow rate of up to 1500 gallons per day, as determined in Rule .1949(a) or .1949(b) of this Section. ATUs shall not be used, however, where wastes contain high amounts of grease and oil, including restaurants and food service facilities. The strength of the influent wastewater shall be similar to domestic sewage with Biological Oxygen Demand (BOD) and suspended solids not to exceed 300 parts per million. ATUs shall comply with the requirements of the National Sanitation Foundation (NSF) Standard 40 for Individual Aerobic Wastewater Treatment Plants and shall be classified as meeting Class I effluent quality. NSF Standard 40 for Individual Aerobic Wastewater Treatment Plants is hereby incorporated by reference including any subsequent amendments and editions. Copies of the standards may be inspected in and copies obtained from the Division of Environmental Health, P.O. Box 27687, Raleigh, N.C. 27611-7687 at no cost. ATUs shall bear the NSF mark and the NSF listed model number or shall bear the certification mark and listed model number of a third party certification program accredited by the American National Standards Institute (ANSI), pursuant to ANSI Policy and Procedures for Accreditation of Certification Programs to certify ATUs in accordance with NSF Standard Number 40. The ANSI Policy and Procedures for Accreditation of Certification Programs is hereby incorporated by reference including any subsequent amendments and editions. Copies of the standard may be inspected in and copies obtained from the Division of Environmental Health, P.O. Box 27687, Raleigh, N.C. 27611-7687 at no cost. ATUs shall only be permitted where the unit is to be operated and maintained by a certified wastewater treatment facility operator employed by or under contract to the county in which the unit is located, and in accordance with this Rule. (1) ATUs shall be constructed and installed in accordance with the plans which have been approved by the Division of Environmental Health and shall comply with all requirements of this Rule. Procedures for plan review and approval shall be in accordance with Rule .1953 of this Section. (2) The rated capacity of ATUs listed as complying with NSF Standard 40 shall not be less than the design daily flow as determined by Rule .1949(a) or .1949(b) of this Section. six inch pipe. No blockouts or openings shall be permitted below the liquid level of the ATU. (B) The inlet into the ATU shall be a straight pipe. (C) The invert of the outlet shall be at least two inches lower in elevation than the invert of the inlet. gauge welded reinforcing wire. The reinforcing wire shall be bent to form an angle of 90 degrees on the ends in order to form a leg not less than four inches long. When the wire is placed in the mold, the four inch legs shall lay parallel with the side wall wire and adjacent to it. (E) Access openings shall be provided in the ATU top. Access shall be provided for cleaning or rodding out the inlet pipe, for cleaning or clearing air or gas passage spaces, as an entrance for inserting the suction hose in compartments that are required to be pumped out, to allow for sampling the effluent, and for access to repair or maintain any system components requiring repair and maintenance. All access openings shall have risers sealed to the top of the ATU and extended at least to six inches above finished grade and designed and maintained to prevent surface water inflow. Rule .1950(i) of this Section shall also be met. (F) Concrete ATUs shall be constructed in accordance with Rule .1954(a)(9), (10), (11) and (12) and .1954(b)(4) of this Section. (G) Fiberglass reinforced plastic ATUs shall be constructed with materials capable of resisting corrosion from sewage and sewage gases, and the active and passive loads on the unit walls. Rule .1948(d) of this Section. (ii) A vacuum test shall be performed on at least one ATU of each model number by an independent testing laboratory, in accordance with ASTM D-4021, Standard Specification for Glass-Fiber Reinforced Polyester Underground Petroleum Storage Tanks, which is hereby incorporated by reference including any subsequent amendments and editions. Copies of the standards may be inspected in and copies obtained from the Division of Environmental Health, P.O. Box 27687, Raleigh, N.C. 27611-7687 at no cost. Unit must withstand negative pressure of 2.5 pounds per square inch (69.3 inches of water) without leakage or failure. Test results shall be included with the specifications that are provided to the state for approval. (iii) Composition of the finished unit shall be at least 30 percent fiberglass reinforcement by weight. Minimum wall thickness shall be one-fourth inch. However, a wall thickness of not less than three-sixteenth inch may be allowed in small, isolated areas of the ATU. (iv) Interior and exterior surfaces shall have no exposed fibers or projections, no blisters larger than one-fourth inch in diameter, and no pores or indentations deeper than one-sixteenth inch. The tank shall be watertight. (H) Prefabricated ATUs other than precast reinforced concrete or fiberglass reinforced plastic units shall be approved on an individual basis based on information furnished by the designer which indicates the unit will provide effectiveness equivalent to reinforced concrete or fiberglass reinforced plastic units. (I) ATUs shall bear an imprint identifying the manufacturer, serial number assigned to the manufacturer's plans and specifications approved by the Division of Environmental Health, and the liquid or working capacity of the unit. The imprint shall be located to the right of the blockout or opening made for the outlet pipe on the outside of the unit. ATUs shall also be permanently marked with the date of manufacture adjacent to the unit imprint or on the top of the unit directly above the imprint. (J) The design, construction, and operation of ATUs shall prevent bypass of wastewater. (K) Electrical circuits to the ATU shall be provided with manual circuit disconnects within a watertight, corrosion-resistant, outside enclosure (NEMA 4X or equivalent) adjacent to the ATU securely mounted at least 12 inches above the finished grade. Control panels provided by the manufacturer shall be installed in a watertight, corrosion-resistant enclosure (NEMA 4X or equivalent) adjacent to the unit or on the side of the facility readily visible from the unit and accessible by maintenance personnel. Conductors shall be conveyed to the disconnect enclosure and control panel through waterproof, gasproof, and corrosion-resistant conduits. Splices and wire junctions, if needed, shall be made outside the ATU in a watertight, corrosion-resistant enclosure (NEMA 4X or equivalent) securely mounted adjacent to the unit at least 12 inches above the finished grade. Wire grips, duct seal, or other suitable material shall be used to seal around wire and wire conduit openings inside the ATU and disconnect enclosure. The ATU shall have an alarm device or devices to warn the user or operator of a unit malfunction or a high water condition. The alarm shall be audible and visible by system users and securely mounted adjacent to the ATU, on the side of the facility in clear view of the unit, or inside the finished occupied space of the facility. If mounted outside, the alarm shall meet NEMA 4X standards or equivalent. The alarm circuit or circuits shall be supplied ahead of any ATU electrical control circuit overload and short circuit protective devices. (4) A settling tank shall be required prior to an ATU serving a design unit with a design daily flow greater than 500 gallons, as determined in Rule .1949(a) or .1949(b) of this Section. The liquid capacity of the settling tank shall be at least equal to the design daily flow as determined in Rule .1949(a) or (b) of this Section. The settling tank may either be an approved prefabricated septic tank or another tank specially designed for a specific individual aerobic sewage treatment plant and approved by the Division of Environmental Health as a part of the plans for the plant. (i) Any private water supply source, except any uncased well or spring . . . . . . 50 feet. (vi) AnyClassIorClassIIreservoir .................................. 70feet, from normal pool elevation. (vii) Anypermanentstormwaterretentionpond .......................... 35feet, from flood pool elevation. (viii) Anyotherlakeorpond .......................................... 35feet, from normal pool elevation. (i) A low-pressure pipe system shall not be required where the separation between the bottom of the nitrification trench and any soil wetness condition is at least 12 inches, but less than 18 inches, and more than six inches of this separation consists of Group I soils. (ii) The restriction in Rule .1956(6)(a)(v) of this Section that saprolite be overlain by at least one foot of suitable or provisionally suitable naturally occurring soil shall not apply. (iii) For new fill systems, a low pressure pipe system shall not be required in order for the minimum separation distance between the trench bottom and any unsuitable soil horizon, rock, or saprolite to be reduced to 18 inches. (iv) For existing fill systems, the minimum separation requirements of Rule .1957(b)(2)(D) of this Section shall be reduced from 48 to 36 inches for conventional systems and from 24 to 18 inches for low-pressure pipe system. The maximum long-term acceptance rate shall be increased by 25 percent for any ground absorption system in soils which are Groups I or II with suitable structure and clay mineralogy. No other reductions in linear footage of nitrification trench or system area shall be applied, except where based on an adjusted design daily sewage flow rate granted in accordance with Rule .1949(c) of this Section. (6) Prior to issuance of an Operation Permit for an ATU, the manufacturer or his licensed representative shall certify that the unit has been properly installed and a contract for operation and maintenance shall have been executed between the unit owner and the county in accordance with Rule .1961(b) of this Section. It shall be a condition of the Operation Permit that subsequent owners of an ATU execute such a contract. The contract shall include the specific requirements for maintenance and operation, responsibilities for maintenance and operation, responsibilities of the owner and system operator, provisions that the contract shall be in effect for as long as the system is in use, and other requirements for the continued proper performance of the ATU. A condition of the Operation Permit shall be that the unit continue to perform in accordance with Class I effluent quality requirements of the National Sanitation Foundation (NSF) Standard Number 40 effective on the date the improvement permit was issued. During each inspection, the operator shall confirm proper mechanical performance, conduct a visual check for unusual color, clogging, oily film, odors, foam, measure settleable aeration chamber solids, and ascertain the need for removing solids, backwash and cleaning of filters, and other maintenance activities. The ground absorption system shall also be inspected and an evaluation of performance shall be made. The operator shall take the necessary steps to assure that needed maintenance is carried out. Semi-annually, samples shall be collected by the system operator and analyzed by a state-approved wastewater testing laboratory of the effluent for Five-Day Biological Oxygen Demand, Suspended Solids, and pH. The aeration tank shall be sampled for mixed liquor suspended solids. Performance monitoring results shall be reported to the local health department and the state quarterly. Remedial action and additional sampling shall be required if monitoring results or inspection indicate that Class I effluent standards are not met. Amended Eff. April 1, 1993; May 1, 1991; December 1, 1990; January 1, 1990. (1) SHALLOW SYSTEMS: Sites classified UNSUITABLE as to soil depth or soil wetness may be reclassified as PROVISIONALLY SUITABLE with respect to soil depth or soil wetness conditions by utilizing shallow placement of nitrification trenches in the naturally occurring soil. Shallow trenches may be used where at least 24 inches of naturally occurring soil are present above saprolite, rock, or soil wetness conditions and all other factors are PROVISIONALLY SUITABLE or SUITABLE. Shallow trenches shall be designed and constructed to meet the vertical separation requirements in Rule .1955(m) of this Section. The long-term acceptance rate shall be based on the most hydraulically limiting naturally occurring soil horizon within 24 inches of the ground surface ortoadepthofonefootbelowthetrenchbottom,whicheverisdeeper. Soilcoverabovetheoriginalgradeshall be placed at a uniform depth over the entire nitrification field and shall extend laterally five feet beyond the nitrification trench. The soil cover shall be placed over a nitrification field only after proper preparation of the original ground surface. The type and placement of soil cover shall be approved by the local health department. (f) Drainage may be used in other types of soil when the requirements of Rule .1957(c) in this Section are met. (3) GRAVELLESS TRENCHES: Modified nitrification trenches or lines, including large diameter pipe (greater than four inches I.D. ), and specially designed porous block systems may be permitted by the local health department. Corrugated Tubing shall be covered with filter wrap at the factory and each joint shall be immediately encased in a black polyethylene sleeve which shall continue to encase the large diameter pipe and wrap until just prior to installation in the trench. Large diameter pipe systems shall be installed in accordance with this Rule and the manufacturer's guidelines. The trench bottom and pipe shall be level (with a maximum fall of one inch in 100 feet). Filter wrap encasing the tubing shall not be exposed to sunlight (ultraviolet radiation) for extended periods. Rocks and large soil clumps shall be removed from backfill material prior to being used. Clayey soils (soil group IV) shall not be used for backfill. The near end of the large diameter pipe shall have an eight-inch by four-inch offset adaptor (small end opening at top) suitable for receiving the pipe from the septic tank or distribution device and making a mechanical joint in the nitrification trench. (E) the long-term acceptance rate shall not exceed 0.8 gallons per day per square foot. (b) Other types of nitrification trenches or lines may be approved by the local health department on a site-specific basis in accordance with Rule .1969 of this Section. (4) INTERCEPTOR DRAINS: Sites classified as UNSUITABLE as to soil wetness conditions because of the presence of lateral water movement may be reclassified PROVISIONALLY SUITABLE as to soil wetness conditions when such water is intercepted and diverted to prevent saturation of the soil absorption system. seeded, unless otherwise specified by the local health department. (6) SAPROLITE SYSTEM: Sites classified UNSUITABLE as to soil depth, with saprolite present, may be reclassified PROVISIONALLY SUITABLE as to soil depth when the provisions of this Paragraph are met. (vi) the saprolite shall have no open and continuous joints, quartz veins, or fractures relic of parent rock to a depth of two feet below the proposed trench bottom. (b) Table III shall be used in determining the long-term acceptance rate for septic tank systems installed pursuant to Paragraph (6) of this Rule. The long-term acceptance rate shall be based on the most hydraulically limiting, naturally occurring saprolite to a depth of two feet below trench bottom. If a low pressure pipe system is used, the long term acceptance rate in Table III shall be reduced by one-half and the system shall be designed in accordance with Rule .1957(a) of this Section, except that Rule .1957 (a)(2)(B) and Rule .1957(a)(3) shall not apply. Saprolite textural classifications shall be determined from disturbed materials and determined by Rule .1941(a)(1) of this Section. Low-pressure distribution shall be used when the total length of nitrification lines exceeds 750 feet in a single system. The design daily flow shall not exceed 1000 gallons. The nitrification field shall be constructed using nitrification trenches with a maximum width of three feet and a maximum depth of three feet on the downslope side of the nitrification trench. The bottom of a nitrification trench shall be a minimum of two feet above rock or saprolite that does not meet the requirements of Subparagraph (6)(a) of this Rule. However, where SUITABLE or PROVISIONALLY SUITABLE soil underlies the trench bottom, this separation distance may be reduced by subtracting the actual soil depth beneath the trench bottom from 24 inches to establish the minimum separation distance from the trench bottom to rock. The bottom of any nitrification trench shall be a minimum of two feet above any wetness condition. Surface and subsurface interceptor drains shall be required on sites with more slowly permeable horizons above the usable saprolite to intercept laterally flowing waters or perched waters. Exceptions to the provisions of Rule .1950(a) found in Rule .1950 and .1951 of this Section shall not apply to systems installed pursuant to this Paragraph [Rule .1956(6)]. Other saprolite systems may be approved on a site-specific basis in accordance with Rule .1948(d) of this Section. Amended Eff. July 1, 1995; April 1, 1993; January 1, 1990; August 1, 1988. (a) Conventional septic tank systems shall utilize a septic tank of approved construction with an approved effluent filter and support case, access devices, and design volume which provides primary treatment of the sewage in accordance with the provisions of these Rules. The effluent filter support case shall be solvent welded to a PVC Schedule 40 outlet pipe with a minimum diameter of three inches inserted through the outlet connective sleeve creating a watertight and mechanically sound joint and shall extend at least 24 inches beyond the tank outlet. The filter and support case shall be installed and maintained in accordance with the filter manufacturer’s specifications. The effluent filter shall be accessible without the operator entering the septic tank and removable by hand. The effluent filter shall be secured in the support case and located under the outlet access opening or manhole. When the top of the septic tank or access manhole is installed below finished grade, the location of each access opening or manhole shall be visibly marked at finished grade. The visible marker(s) shall be located over or within a five foot radius of each access opening or manhole. Themarker(s)shallbeidentifiedasaseptic tank locator. When not placed over each access opening or manhole, the marker(s) shall indicate location of tank access opening(s) or manhole(s). The filtered effluent from the septic tank shall be conveyed to an approved nitrification line where the soil provides for final treatment and disposal of the sewage. (b) Table II shall be used in determining the maximum long-term acceptance rate for septic tank systems of conventional trench design. The long-term acceptance rate shall be based on the most hydraulically limiting naturally occurring soil horizon within three feet of the ground surface or to a depth of one foot below trench bottom, whichever is deeper. comparable facilities indicates that the grease and oil content of the effluent will be less than 30 mg/l and the chemical oxygen demand (COD) will be less than 500 mg/l. (c) The design daily sewage flow shall be divided by the long-term acceptance rate to determine the minimum area of nitrification trench bottom. The total length of the nitrification line shall be determined by dividing the required area of nitrification trench bottom by the trench width, not to exceed 36 inches. Trenches shall be located not less than three times the trench width on centers with a minimum spacing of five feet on centers. (d) The local health department may permit the use of a bed system on sites where the soil texture can be classified into either Soil Groups I, II, or III, meeting the other requirements of this Section, and only on lots which are limited by topography, space, or other site-planning considerations. In such cases, the number of square feet of bottom area needed shall be increased by 50 percent over what would be required for a trench system. Nitrification lines shall be at least 18 inches from the side of the bed and shall have lines on three-foot centers. When the design daily flow exceeds 600 gallons per day, bed systems shall not be used. separating the trench from the distribution device and the nitrification line. All joints from the septic tank to the nitrification line shall be watertight. (f) When four or six-inch diameter corrugated plastic tubing is used for nitrification lines, it shall be certified as complying with ASTM F 405, Standard Specification for Corrugated Polyethylene (PE) Tubing and Fittings, which is hereby adopted by reference in accordance with G.S. 150B-21.6. The corrugated tubing shall have three rows of holes, each hole between one-half inch and three-fourths inch in diameter, and spaced longitudinally approximately four inches on centers. The rows of holes may be equally spaced 120 degrees on centers around the periphery, or three rows may be located in the lower portion of the tubing, the outside rows being approximately on 120-degree centers. The holes may be located in the same corrugation or staggered in adjacent corrugations. Other types of pipe may be used for nitrification lines provided the pipe satisfies the requirements of this Section for hole size and spacing and the pipe has a stiffness equivalent to corrugated polyethylene tubing (ASTM F-405) or stronger. The nitrification line shall be located in the center of the nitrification trench. (g) Nitrification trenches shall be constructed as level as possible but in no case shall the fall in a single trench bottom exceed one-fourth inch in 10 feet as determined by an engineer's level or equivalent. When surface slopes are greater than twopercent,thebottomofthenitrificationtrenchesshallfollowthecontouroftheground. Anengineer'slevelorequivalent shall be used for installation and inspection. The nitrification trench shall not exceed a width of three feet and a depth of three feet, except as approved by the local health department. (h) Rock used in soil absorption systems shall be clean, washed gravel or crushed stone and graded or sized in accordance with size numbers 3, 4, 5, 57, or 6 of ASTM D-448 (standard sizes of coarse aggregate) which is hereby adopted by reference in accordance with G.S.150B-21.6. Copies may be inspected in, and copies obtained from the Division of Environmental Health, P.O. Box 27687, Raleigh, North Carolina 27611-7687. The rock shall be placed a minimum of one foot deep with at least six inches below the pipe and two inches over the pipe and distributed uniformly across the trench bottom and over the pipe. (i) The soil cover over the nitrification field shall be to a depth of at least six inches. The finished grade over the nitrification field shall be landscaped to prevent the ponding of surface water and runoff of surface water shall be diverted away from the nitrification field. Soil cover above the original grade shall be placed at a uniform depth over the entire nitrification field, except as required to prevent the ponding of surface water, and shall extend laterally five feet beyond the nitrification trench. The soil cover shall be placed over a nitrification field only after proper preparation of the original ground surface. The type of soil cover and placement shall be approved by the local health department. (j) Effluent distribution devices, including distribution boxes, flow dividers, and flow diversion devices, shall be of sound construction, watertight, not subject to excessive corrosion, and of adequate design as approved by the local health department. Effluent distribution devices shall be separated from the septic tank and nitrification lines by a minimum of two feet of undisturbed or compacted soil and shall be placed level on a solid foundation of soil or concrete to prevent differential settlement of the device. The installer shall demonstrate that the distribution devices perform as designed. (3) Two or more chambers must be provided, with total length-to-width ratio at least 2:1. Chamber opening and outlet sanitary tee must extend down at least 50 percent of the liquid depth. (4) Access manholes, with a minimum diameter of 24 inches, shall be provided over each chamber and sanitary tee. The access manholes shall extend at least to finished grade and be designed and maintained to prevent surface water infiltration. The manholes shall also have readily removable covers to facilitate inspection, filter maintenance, and grease removal. (5) One tank or multiple tanks, in series, shall be constructed in accordance with Rules .1952, .1953, and .1954 of this Section, and the provisions of Paragraphs (k)(3) and (k)(4) of this Rule. (6) Where it has been demonstrated that specially designed grease interceptors will provide improved performance, the grease trap liquid capacity may be reduced by up to 50 percent. (l) Stepdowns or drop boxes may be used where it is determined by the local health department that topography prohibits the placement of nitrification trenches on level grade. Stepdowns shall be constructed of two linear feet of undisturbed soil and constructed to a height which fully utilizes the upstream nitrification trench. Effluent shall be conveyed over the stepdownthroughnonperforatedpipeortubingandbackfilledwithcompactedsoil. Dropboxesshallbeconstructedsothat the invert of the inlet supply pipe is one inch above the invert of the outlet supply pipe which is connected to the next lower drop box. The top of the trench outlet laterals, which allow effluent to move to the nitrification lines, shall be two inches below the invert of the outlet supply line. Area taken up by stepdowns and drop boxes shall not be included as part of the minimum area required for nitrification trench bottoms. (m) Nitrification trenches shall be installed with at least one foot of naturally occurring soil between the trench bottom and saprolite, rock, or any soil horizon unsuitable as to structure, clay mineralogy or wetness. If the separation between the bottom of the nitrification trench and any soil wetness condition is less than 18 inches, and if more than six inches of this separation consists of Group I soils, a low pressure pipe system shall be required. (1) Building drains and building sewers shall be in accordance with the state plumbing code and approved by the local building inspector. (2) Pipe material shall be specified to comply with the applicable ASTM standards, with methods of joining and other special installation procedures specified which are appropriate for the pipe to be used. (3) Gravity sewers shall be designed to maintain scour velocities of at least two feet per second with the pipe half full and a minimum of one foot per second at the peak projected instantaneous flow rate. Force mains shall be sized to obtain at least a two-foot per second scour velocity at the projected pump operating flow rate. (4) Infiltration and exfiltration shall not exceed 100 gallons per day per inch diameter per mile of gravity sewer pipe or 20 gallons per day per inch diameter per mile of pressure pipe in force mains and supply lines. (5) Three-foot minimum cover shall be provided for all sewers unless ferrous material pipe is specified. Ferrous material pipe or other pipe with proper bedding to develop design-supporting strength shall be provided where sewers are subject to traffic-bearing loads. otherwise allowed by the North Carolina Plumbing Code. When used, cleanouts are required at least every 50 feet for four-inch sewers and every 100 feet for six-inch sewers and at all junctions and bends which exceed 45 degrees. (8) Additional ventilation provisions may be required for collection sewers. Air relief valves shall be provided as needed for force mains. (p) Alternating dual field nitrification systems may be utilized where soils are limited by high clogging potentials (Soil Groups III and IV) and where the potential for malfunction and need for immediate repair is required. Alternating dual nitrification fields shall be designed with two complete nitrification fields, each sized a minimum of 75 percent of the total area required for a single field and separated by an effluent flow diversion valve. The diversion valve shall be constructed to resist 500 pounds crushing strength, structurally sound, and shall be resistant to corrosion. Valves placed below ground level shall be provided with a valve box and suitable valve stem so that they may be operated from the ground surface. Amended Eff. August 1, 1991; January 1, 1990; August 1, 1988; February 1, 1987; Temporary Amendment Eff. January 1, 1999. (1) The minimum requirement for the liquid depth is 36 inches. (2) A minimum of nine inches freeboard is required, the freeboard being the air space between the top of the liquid and the bottom side of the lid or cap of the tank. (3) The length of the septic tank shall be at least twice as long as the width. (4) There shall be three inlet openings in the tank, one on the tank end and one on each sidewall of the inlet end of the tank. The blockouts for these openings shall leave a concrete thickness of not less than one inch in the tank wall. The blockouts shall be made for a minimum of four-inch pipe or a maximum of six-inch pipe. The outlet pipe penetration of the tank shall be through a resilient, watertight, sealed, non-corrosive and flexible connective sleeve. The outlet pipe penetration shall be precast to be compatible with the connective sleeve. No pipe penetration points or openings shall be permitted below the tank liquid level. (5) The inlet pipe in the tank shall be a straight pipe. (6) The outlet shall be through an approved effluent filter secured in place in an effluent filter support case. The effluent filter support case shall serve as a functioning sanitary tee with the bottom inlet extending down between 25 and 40 percent of the liquid depth. The approved effluent filter and support case shall be furnished by the septic tank manufacturer. The invert of the outlet shall be at least two inches lower in elevation than the invert of the inlet. (7) Other equivalent methods of supporting the effluent filter and for making the pipe penetrations shall be approved by the On-Site Wastewater Section. (c) Specifications for application, installation, operation, and maintenance. partition shall be located at a point not less than two-thirds nor more than three-fourths the length of the tank from the inlet end. The top of the partition shall terminate two inches below the bottom side of the tank top in order to leave space for air or gas passage between compartments. The top and bottom halves of the partition shall be cast in such manner as to leave a water passage slot four inches high for the full width of the tank. The partition (both halves) shall be reinforced by the placing of six-inch by six-inch No.10 gage welded reinforcing wire. The reinforcing wire shall be bent to form an angle of 90 degrees on the ends in order to form a leg not less than four inches long. When the wire is placed in the mold the four-inch legs should lay parallel with the sidewall wire and adjacent to it. It is recognized that there are other methods of constructing a partition or two-compartment tank. Any method other than the one described will be considered on an individual basis for approval by the On-Site Wastewater Section. However, the tank wall thickness must remain not less than two and one-half inches thick throughout the tank except for the pipe penetrations. (10) Adequate access openings must be provided in the tank top. Access shall be provided for cleaning or rodding out of the inlet pipe, for cleaning or clearing the air or gas passage space above the partition, for pumping of each compartment, and for the maintenance of the effluent filter. This shall be accomplished by properly locating two manholes or access openings with each having a minimum opening of 15 inches by 15 inches or 17 inches in diameter as the opening cuts the plane of the bottom side of the top of the tank or other equidimensional opening with at least 225 square inches. The manhole covers shall be beveled on all sides in such manner as to accommodate a uniform load of 150 pounds per square foot without damage to the cover or the top of the tank. If the top of the tank is to be multislab construction, the slabs over the inlet of the tank, partition, and outlet of the tank must not weigh in excess of 150 pounds each. Multislab construction allows for the elimination of the manholes. Manhole covers, tank lids, access opening covers, or slabs shall have a handle of steel or other rot-resistant material equivalent in strength to a No. 3 reinforcing rod (rebar). (11) The concrete tank and tank lid shall be reinforced by using a minimum reinforcing of six-inch by six-inch No. 10 gage welded steel reinforcing wire in the top, bottom ends, and sides of the tank. The reinforcing wire shall be lapped at least six inches. Concrete cover shall be required for all reinforcement. Reinforcement shall be placed to maximize the structural integrity of the tank. The tank, tank lid, riser and riser cover shall be able to withstand a uniform live loading of 150 pounds per square foot in addition to all loads to which an underground tanks, riser, or riser cover is normally subjected, such as the dead weight of the concrete and soil cover, active soil pressure on tank walls, and the uplifting force of the ground water. Additional reinforcement shall be required when the loads on a concrete tank, riser, or riser cover are exceeded by subjecting it to vehicular traffic or when the top of the tank is placed deeper than three feet below the finished grade. (12) The top, bottom, ends, and sides of the tank must have a minimum thickness of two and one-half inches. (13) A minimum 28-day concrete compressive strength of 3,500 pounds per square inch shall be used in the construction of the septic tank, concrete access riser and riser cover. The concrete shall achieve a minimum compressive strength of 3,000 pounds per square inch prior to removal of the tank from the place of manufacture. It shall be the responsibility of the manufacturer to certify that this condition has been met prior to shipment. A septic tank shall be subject to testing to ascertain the strength of the concrete prior to its being approved for installation. Recognized devices for testing the strength of concrete include a properly calibrated Schmidt Rebound Hammer or Windsor Probe Test. Accelerated curing in the mold by use of propane gas or other fuels is prohibited, except in accordance with accepted methods and upon prior approval of the State. joint by using a mastic, butyl rubber, or other pliable sealant that is waterproof, corrosion-resistant, and approved for use in septic tanks. The sealant shall have a minimum size of one inch nominal diameter or equivalent. Before sealing, the joint shall be smooth, intact, and free of all deleterious substances. Tank halves shall be properly aligned to ensure a tight seal. The sealant shall be provided by the manufacturer. (15) All tanks produced shall bear an imprint identifying the manufacturer, the serial number assigned to the manufacturer's plans and specifications approved by the State, and the liquid or working capacity of the tanks. This imprint shall be located to the right of the blockout made for the outlet pipe on the outlet end of the tank. All tanks shall also be permanently marked with the date of manufacture adjacent to the tank imprint or on the top of the tank directly above the imprint. (16) Risers and access covers shall have a clear opening sized to allow for maintenance and removal of internal devices of the septic tank and shall not allow accidental entry. The access cover and tank lid shall be designed, constructed, and maintained to prevent unauthorized access. Risers shall be sealed watertight where they join the top of the septic tank, and constructed to prevent water inflow through the lid or cover. (b) Pump tanks shall meet the construction requirements of Paragraph (a) of this Rule with the following modifications. (1) Tanks shall be cast with a single compartment, or, if a partition is provided, the partition shall be cast to contain a minimum of two four-inch diameter circular openings, or equivalent, located no more than 12 inches above the tank bottom. (2) There shall be no requirement as to tank length, width, or shape, provided the tank satisfies all other requirements of this Section. (3) The invert of the inlet openings shall be located within 12 inches of the tank top. No freeboard shall be required in the pump tank. (4) After joining, tanks manufactured in two sections shall be plastered along the joint with hydraulic cement, cement mortar, or other waterproofing sealant. Other methods of waterproofing tanks may be used as specifically approved in the plans and specifications for the tank. Prior to backfilling, the local health department shall make a finding that a two section tank is watertight if a soil wetness condition is present within five feet of the elevation of the top of the tank. (5) Tanks shall be vented and accessible for routine maintenance. A watertight access manhole with removable lid shall be provided over the pump with a minimum diameter of 24 inches. Theaccessmanholeshallextendatleast to six inches above finished grade and be designed and maintained to prevent surface water inflow. Larger or multiple manholes shall be provided when two or more pumps are required. Pumps shall be removable without requiring entrance into the tank. Manhole lids and electrical controls shall be secured against unauthorized access. Manhole risers shall be joined to the tank top and sealed in accordance with Paragraphs (a)(12) and (b)(4) of this Rule. (6) All pump tanks shall bear an imprint identifying the manufacturer, pump tank serial number assigned by the Division of Environmental Health, and the liquid or working capacity of the tank. The imprint shall be located to the left of the outlet blockout. All tanks shall also be permanently marked with the date of manufacture adjacent to the tank imprint or on the top of the tank directly above the imprint. (c) Plans for prefabricated tanks, risers and riser covers, other than those approved under Paragraphs (a) or (b) of this Rule shall be approved on an individual basis as determined by the information furnished by the designer which indicates the tank, riser or riser cover will provide equivalent effectiveness as those designed in accordance with the provisions of Paragraphs (a) and (b) of this Rule. (1) Cast-in-place concrete septic and pump tanks shall have a minimum wall thickness of six inches. (2) Concrete block or brick masonry tanks shall have a minimum wall thickness of at least six inches when the design volume is less than 1,000 gallons and a minimum wall thickness of at least eight inches when the design volume is 1,000 gallons or more. All joints between masonry units shall be mortared using masonry cement mortar or equivalent. The joints shall have a nominal thickness of three-eighths inch. All concrete block masonry tanks shall have a minimum wall reinforcement of number three reinforcing bars on 20-inch centers, or equivalent. The maximum allowable reinforcement spacing in either direction shall be four feet. All block wall cores shall be filled with concrete with a minimum compressive strength of 3,000 pounds per square inch. All tanks constructed of block or brick shall be plastered on the inside with a 1:3 mix (one part cement, three parts sand) of Portland cement at least three-eighths inch thick or the equivalent using other approved waterproofing material. (3) The bottom of the built-in-place tank shall be poured concrete with a minimum thickness of four inches. All built-in-place tanks shall be reinforced to satisfy the structural strength requirements of Paragraph (a)(9) of this Rule. Reinforcement shall be placed in both directions throughout the entire tank, including top, bottom, walls, and ends. Statutes, this Section, and Approval conditions. If the approved products or materials are found to be in non-compliance, the Operation Permit shall not be issued or shall be denied. The State shall suspend or revoke the product approval upon a finding that the information submitted is falsified, the product has been subsequently altered, or subsequent experience with the product results in altered conclusions about its design or performance. Suspension or revocation of the product approval shall not affect systems previously installed pursuant to the approval. Amended Eff. August 1, 1991; January 1, 1990; Temporary Amendment Eff. January 1, 1999. Temporary Amendment Eff. January 1, 1999.
finished grade, the location of each manhole shall be visibly marked at finished grade. Any system serving a design unit with a design sewage flow greater than 3,000 gallons per day shall have access manholes that extend at least to finished grade and be designed and maintained to prevent surface water inflow. The manholes shall be sized to allow proper inspection and maintenance. All dosing tanks shall have a properly functioning high-water alarm. The alarm shall be audible and visible by system users and weatherproof if installed outdoors. The alarm circuit shall be provided with a manual disconnect in a watertight, corrosion-resistant outside enclosure (NEMA 4X or equivalent) adjacent to the dosing tank. (A) Pump tanks for systems with nitrification fields installed in Soil Group I, II, or III soils, as defined in these Rules, shall have a minimum liquid capacity equal to two-thirds of the required septic tank liquid capacity. (B) Pump tanks for systems installed in Group IV soils shall have a minimum liquid capacity equal to the required septic tank liquid capacity. (C) The minimum liquid capacity of any pump tank shall be 750 gallons. (A) The minimum liquid capacity of septic tanks for places of business or places of public assembly with a design sewage flow of 600 gallons per day or less shall be determined in accordance with the following: V = 2Q; where V is the liquid capacity of the septic tank and Q is the design daily sewage flow. (B) Individual residences with more than five bedrooms, multiple-family residences, individual septic tank systems serving two or more residences, or any place of business or public assembly where the design sewage flow is greater than 600 gallons per day, but less than 1,500 gallons per day, the liquid capacity of the septic tank shall be designed in accordance with the following: V = 1.17Q + 500; where V is the liquid capacity of the septic tank and Q is the design daily sewage flow. The minimum liquid capacity of a septic tank serving two or more residences shall be 1,500 gallons. (C) Where the design sewage flow is between 1,500 gallons per day and 4,500 gallons per day, the liquid capacity of the septic tank shall be designed in accordance with the following: V=0.75Q+1,125;where V is the liquid capacity of the septic tank and Q is the design daily sewage flow. (D) Where the design sewage flow exceeds 4,500 gallons per day, the septic tank shall be designed in accordance with the following: V = Q; where V is the liquid capacity of the septic tank and Q is the design daily sewage flow. (E) The minimum liquid capacity requirements of Subparagraph (b)(2) of this Rule shall be met by use of a single two-compartment septic tank or by two tanks installed in series, provided the first tank is constructed without a baffle wall and contains at least two-thirds of the total required liquid capacity. The minimum capacity of any septic tank shall be 750 gallons. (D) An alternate method to determine minimum liquid capacity of a pump tank shall be to provide for the minimum pump submergence requirement (Subparagraph (c)(5) of this Rule), the minimum dose volume requirement (Paragraph (a) oft his Rule), and the minimum emergency storage capacity requirement. The emergency storage capacity requirement is determined based on the type of facility served, the classification of surface waters which would be impacted by a pump tank failure, and the availability of standby power devices and emergency maintenance personnel. The emergency storage capacity shall be the freeboard space in the pump tank above the high-water alarm activation level plus the available freeboard space in previous tankage and in the collection system below the lowest ground elevation between the pump tank and the lowest connected building drain invert. The minimum emergency storage capacity for residential systems and other systems in full-time use on sites draining into WS-I, WS-II, WS-III, SA, SB, and B waters shall be 24 hours, without standby power, or 12 hours with standby power manually activated, or four hours with standby power automatically activated or with a high-water alarm automatically contacting a 24-hour maintenance service. The minimum emergency storage capacity for systems not in full-time use and for all systems at sites draining into all other surface waters shall be 12 hours without standby power, or eight hours with standby power manually activated, or four hours with standby power automatically activated or with a high-water alarm automatically contacting a 24-hour maintenance service. (E) Notwithstanding Paragraphs (c)(1) (A)-(D), other criteria for pump tank capacity may be approved by the local health department and the State for raw sewage lift stations, pressure sewer systems, and systems with design flows exceeding 3,000 gallons per day. (2) The effluent pump shall be capable of handling at least one-half inch solids and designed to meet the discharge rate and total dynamic head requirements of the effluent distribution system. The pump shall be listed by Underwriter's Laboratory or an equivalent third party electrical testing and listing agency, unless the proposed pump model is specified by a registered professional engineer. (3) Pump discharge piping shall be of Schedule 40 PVC or stronger material and adequately secured. Fittings and valvesshallbeofcompatiblecorrosion-resistantmaterial. Athreadedunion,flange,orsimilardisconnectdevice shall be provided in each pump discharge line. All submersible pumps shall be provided with a corrosion-resistant rope or chain attached to each pump enabling pump removal from the ground surface without requiring dewatering or entrance into the tank. Valves shall also be readily accessible from the ground surface. (d) Siphons and siphon dosing tanks may be used when at least two feet of elevation drop can be maintained between the siphon outlet invert and the inlet invert in the nitrification field distribution system. (1) Siphon dosing tanks shall be designed in accordance with the minimum dose requirements in this Rule and shall meet the construction requirements of this Section. The siphon dose tank shall provide at least 12 inches of freeboard,andtheinletpipeshallbeatleastthreeinchesabovethesiphontriplevel. Thehigh-wateralarmshall be set to activate within two inches of the siphon trip level. (2) Siphon dosing tanks shall have a watertight access opening over each siphon with a minimum diameter of 24 inches and extending to finished grade and designed to prevent surface water inflow. (3) The slope and size of the siphon discharge line shall be sufficient to handle the peak siphon discharge by gravity flow without the discharge line flowing full. Vents for the discharge lines shall be located outside of the dosing tank or otherwise designed to not serve as an overflow for the tank. (4) Antisiphon holes (three-sixteenth inch) shall be provided when the discharge or invert elevation of the distribution system is below the high-water alarm elevation in the pump tank, or in accordance with pump manufacturer's specifications. Check valves shall be provided when the volume of the supply line is greater than 25 percent of the dosing volume, or in accordance with pump manufacturer's specifications. When provided, the antisiphon hole shall be located between the pump and the check valve. (5) Sealed mercury control floats or similar devices designed for detecting liquid levels in septic tank effluent shall be provided to control pump cycles. A separate level sensing device shall be provided to activate the high-water alarm. Pump-off level shall be set to keep the pump submerged at all times or in accordance with the manufacturer's specifications. A minimum of 12 inches of effluent shall be maintained in the bottom of the pump tank. The high-water alarm float shall be set to activate within six inches of the pump-on level. The lag pump float switch, where provided, shall be located at or above the high-water alarm activation level. (6) Pump and control circuits shall be provided with manual circuit disconnects within a watertight, corrosion-resistant, outside enclosure (NEMA 4X or equivalent) adjacent to the pump tank, securely mounted at least 12 inches above the finished grade. The pump(s) shall be manually operable without requiring the use of special tools or entrance into the tank for testing purposes. Conductors shall be conveyed to the disconnect enclosure through waterproof, gasproof, and corrosion-resistant conduits, with no splices or junction boxes provided inside the tank. Wire grips, duct seal, or other suitable material shall be used to seal around wire and wire conduit openings inside the pump tank and disconnect enclosure. (7) For systems requiring duplex and multiplex pumps, a control panel shall be provided which shall include short-circuit protection for each pump and for the control system, independent disconnects, automatic pump sequencer, hand-off-automatic (H-O-A) switches, run lights, and elapsed time counters for each pump. Alarm circuits shall be supplied ahead of any pump overload or short circuit protective devices. The control panel must be in a watertight, corrosion-resistant enclosure (NEMA 4X or equivalent) unless installed within a weathertight building. The panel shall be protected from intense solar heating. (8) Dual and multiple fields shall be independently dosed by separate pumps which shall automatically alternate. The supply lines shall be "H" connected to permit manual alternation between fields dosed by each pump. "H" connection valving shall be readily accessible from the ground surface, either from the pump tank access manhole or in a separate valve chamber outside the pump tank. Other equivalent methods of dosing dual or multiple fields may be approved by the State. (1) Siphon dosing tanks shall be designed in accordance with the minimum dose requirements in this Rule and shall meet the construction requirements of this Section. The siphon dose tank shall provide at least 12 inches of free board, and the inlet pipe shall be at least three inches above the siphon trip level. Thehigh-wateralarmshall be set to activate within two inches of the siphon trip level. (4) All siphon parts shall be installed in accordance with the manufacturer's specifications. All materials must be corrosion-resistant, of cast iron, high density plastic, fiberglass, stainless steel, or equal. (5) Siphon dosing tanks shall have a properly functioning high-water alarm that is audible and visible by system users and weatherproof if installed outdoors in an enclosure (NEMA 4X or equivalent). Amended Eff. August 1, 1991; January 1, 1990; Temporary Amendment Eff. January 1, 1999. (e) Raw sewage lift stations shall meet the construction standards of this Section and all horizontal setback requirements for sewage treatment and disposal systems in accordance with Rule .1950(a) of this Section unless the station is a sealed, watertight chamber, in which case the setback requirements for collection sewers in Rule .1950(e) of this Section shall apply. Sealed, watertight chambers shall be of a single, prefabricated unit, such as fiberglass, with sealed top cover, and preformed inlet and outlet pipe openings connected with solvent welds, O-ring seals, rubber boots, stainless steel straps, or equivalent. Dual pumps shall be provided for stations serving two or more buildings or for a facility with more than six water closets. Pumps shall be listed by Underwriter's Laboratories or an equivalent third party electrical testing and listing agency, and shall be grinder pumps or solids-handling pumps capable of handling at least three-inch spheres unless the station serves no more than a single water closet, lavatory, and shower, in which case two-inch solids handling pumps shall be acceptable. Minimum pump capacity shall be 2.5 times the average daily flow rate. The dosing volume shall be set so that the pump-off time does not exceed 30 minutes, except for stations serving single buildings, and pump run-time shall be from three to ten minutes at average flow. Pump station emergency storage capacity and total liquid capacity shall be determined in accordance with Paragraph (c)(1)(D) of this Rule except for a sealed, watertight chamber serving an individual building, in which case a minimum storage capacity of eight hours shall be required. Allotherapplicablerequirementsforpumptanks and pump dosing systems in accordance with Paragraph (c) of this Rule shall also apply to raw sewage lift stations. (3) which, on the date system construction is proposed to begin, is not capable of being served by a community or public sewerage system. (b) For those lots or tracts of land described in Rule .1951(a) of this Section, where any of the minimum horizontal distance requirements prescribed in Rule .1950(a)(4), (11), (12), or (13) of this Section can be met, such minimum horizontal distances shall be required. (3) Rule .1950(a)(12) and (13) of this Section, the minimum horizontal distance shall be not less than 5 feet. (d) All other provisions of this Section except as exempted by this Rule shall apply to the lots or tracts of land described in Rule .1951(a) of this Section. Any rules and regulations of the Commission for Health Services or any local board of health in effect on June 30, 1977, which establish greater minimum distance requirements than those provided for in this Section, shall remain in effect and shall apply to a lot or tract of land to which Rule .1950(a)(4), (11), (12), or (13) of this Section do not apply. (e) It shall be the responsibility of any owner of a lot or tract of land, who applies for a permit required by Rule .1937 of this Section, and who seeks, under the provisions of Rule .1951(a) of this Section, to exempt his lot or tract of land from any of the minimum horizontal distance requirements of Rule .1950(a)(4), (11), (12), or (13) of this Section to provide to the local health department necessary records of title to the lot or tract of land for which the exemption is sought in order that the local agency may determine whether the applicant is entitled to any such exemption. (f) For those lots or tracts of land which, on the effective date of this Section, are specifically described in a deed or recorded plat, and the minimum horizontal distance requirements prescribed in Rule .1950(a)(15)(B) cannot be met, the maximum feasible horizontal distance, as determined by the local health department, shall be required, but shall not be less than ten feet.